it’s been a while since i have sent something via post. 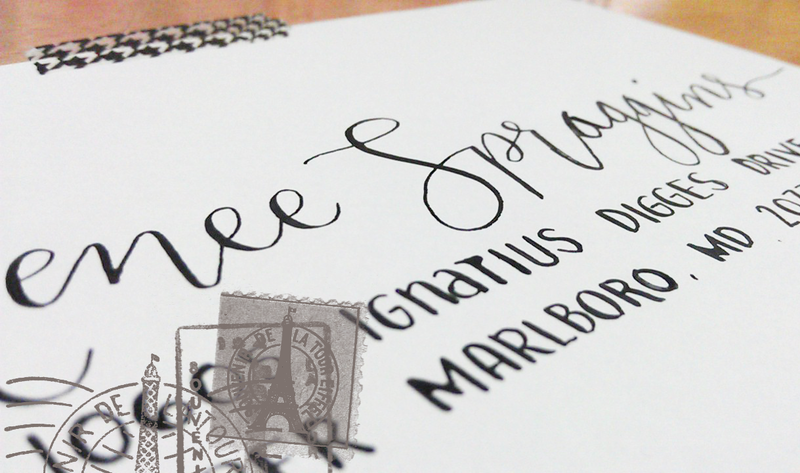 excited as i was, i have decided to go the extra mile and used calligraphy to write the address. i initially wrote directly on the envelope but learned too late that it does not absorb ink well. oops… one envelope wasted, sorry. then i have decided to write the address on a nib-and-ink-friendly paper and taped it on the envelope. that one worked. i hope the receiver would like it as much as i have enjoyed making it. when was the last time you have received something from the post? Ohhh I’ve wanted to try out Calligraphy for a while now. I’m so impressed that you can do it :). I even have a calligraphy set that I got for Christmas from a friend, but I still haven’t used it. I think the last time I received something in the mail was during my birthday earlier in the year. But a friend of mine mailed me a letter,so I’m eagerly awaiting that at the moment :). ohh, thanks so much. you are so kind. i am very new at this skill. and this series of posts i have going on is a commitment to get better at calligraphy. 🙂 you can learn on your own just by looking through tons of video/tutorials available.